Devotional practices play a crucial role in helping the faithful to pray without ceasing by using a variety of practices as a means of filling everyday life with prayer to God. Examples include the Rosary, celebrations honoring Mary and other saints, the Stations of the Cross, the Angelus, and the use of sacramentals. Properly used, devotional practices extend the graces from the sacraments it into daily life. 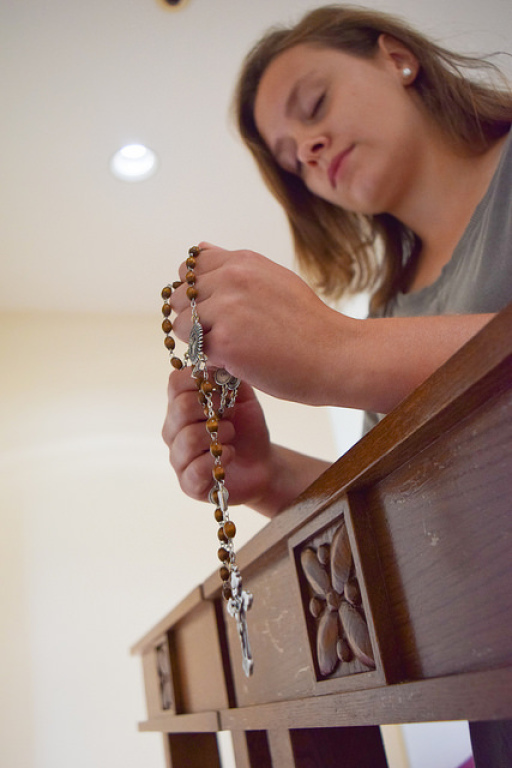 The Rosary is a scripture based prayer that recalls important events or mysteries in the life of Jesus Christ. During the prayer we are calling upon Mary to help us to better understand the life of her Son. We also pray the Rosary to honor and unite ourselves with Jesus and Mary, and to give praise to our Triune God. The beads of the Rosary are divided into five decades and each decade represents an event (or mystery) from the life of Jesus Christ. These five events are grouped into a set of Mysteries. It is recommended that we pray the Rosary every day, and so, each day of the week is assigned a set of mysteries to pray for that day. Pope Saint John Paul II recommended that we pray the Joyful mysteries on Monday and Saturday, the Luminous on Thursday, the Sorrowful on Tuesday and Friday, and the Glorious on Wednesday and Sunday. First Fridays in the Little Church during Adoration after the 8:45 AM Mass. Rosary in Spanish is on Mondays at 7 PM in the Little Church. Rosario en español los lunes a las 7 PM en la pequeña iglesia. 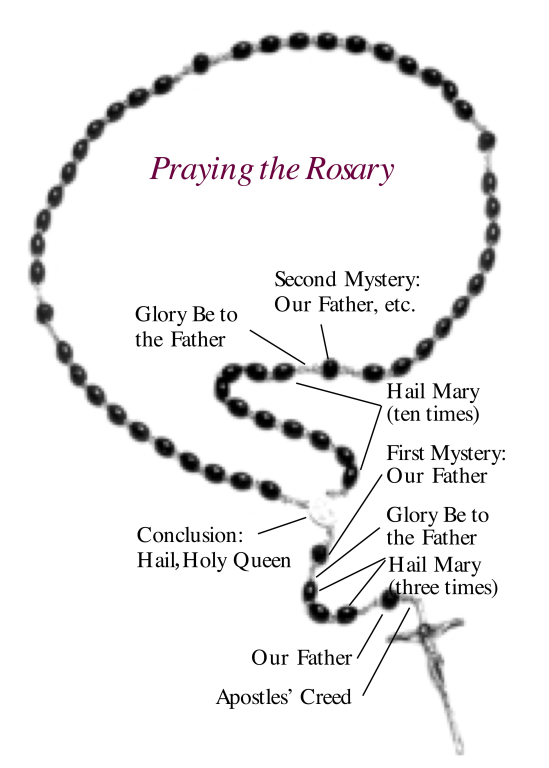 If you would like to learn how to pray the Rosary, you can access a printable guide above (Praying the Rosary). Sometimes it is easier to learn how to pray by praying with someone. 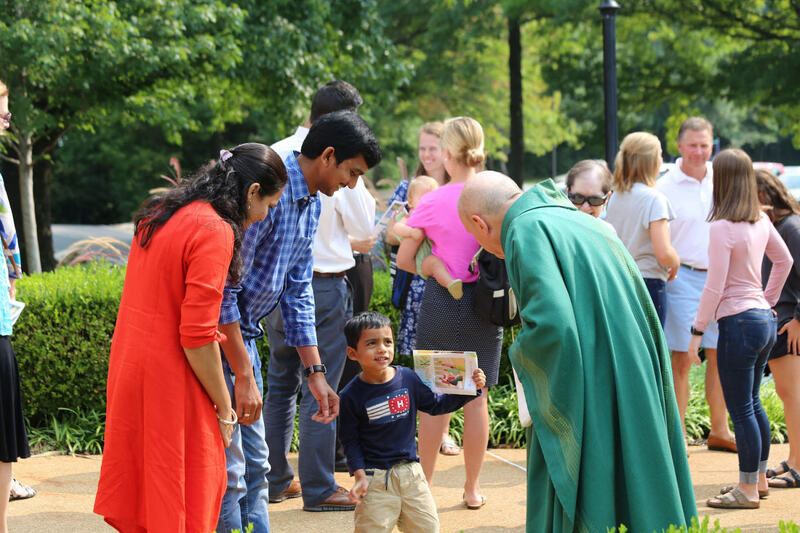 The videos below are the four sets of Mysteries prayed by Archbishop Carlson and some of the Seminarians at the Rigali Center here in the Archdiocese of St. Louis. We honor, but do not worship, Mary and the saints in heaven. They lived lives of virtue and holiness that are presented to us as examples for us to follow. They completed their journey and are now with God. However, we can still ask them for help. Just as we can ask other people here on earth to pray for us, we can ask people in heaven, the saints, to pray for us. Here at Ascension we honor Mary with communal devotions under the title of Our Lady of Perpetual Help and ask her to help us on our journey. 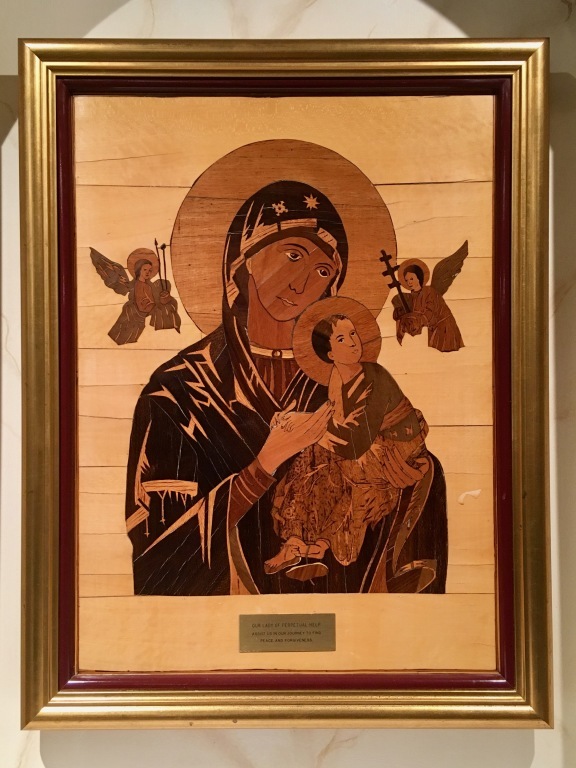 Our Lady of Perpetual Help devotions are on Tuesdays after the 8 am Mass in the Main Church. There are different prayers associated with this devotion and different parishes use different ones. At Ascension, we provide prayer cards to use for all those who wish to participate in this devotional practice. 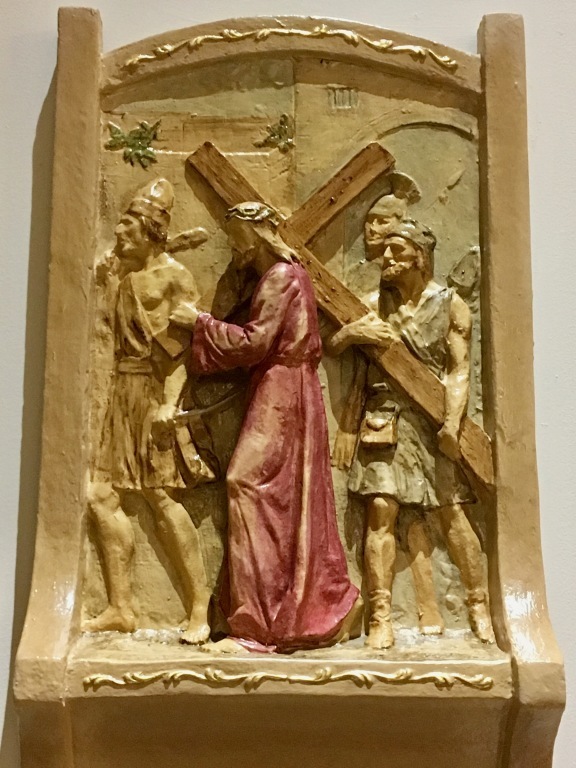 The Stations of the Cross are selections of particular moments at the end of Jesus Christ's life that help us to meditate on the passion, death and resurrection of Jesus Christ, so that we can better understand Jesus and His love for us. This devotion began as the practice of pious pilgrims to Jerusalem who would retrace the journey of Jesus Christ that won for us salvation. Over time, journeying with Jesus through His passion, death, and resurrection in Jerusalem became more difficult. Those who wished to make the journey but were unable to do so, would recall particular moments of that journey, while remaining in their church building, so that they could journey with Jesus spiritually rather than physically. The practice developed into the 14 stations (moments) currently found in almost every church, including our two churches. All are invited to pray the Stations of the Cross privately in our churches using the numbered stations on the church walls. We pray the Stations of the Cross as a parish every Friday during Lent at 7 pm in the Main Church. Booklets with the Stations of the Cross and their prayers are provided for use when we pray them together. There are many different prayers and meditations that are associated with the Stations of the Cross. However, there are two basic sets of stations. The first is the more traditional set of 14 stations, which developed from the middle ages and is attributed to St. Francis of Assisi, these are the stations commonly seen in churches. You can click the image below for a printable pamphlet with the traditional 14 stations. The second set was created by Pope St. John Paul II and is based more directly on scripture. This prayer reminds us of the wonderful gift of the Incarnation. Quoting the Gospel of Luke, we recall St. Gabriel the Archangel appearing to Mary to reveal God's plan, Mary's humble acceptance of God's plan, and the Incarnation of the Son of God, Jesus Christ. This devotional prayer is traditionally prayed three times a day (6 am, noon, and 6 pm) and is accompanied by the ringing of the church bells. When the bells rang, all of the people who heard it, would stop whatever they were doing and pray this prayer. Here at Ascension we pray the Angelus at noon before Mass as our bells are ringing for the Angelus. The prayer is provided below, along with a video of the Angelus. When there is more than one person, the verses (V.) are prayed out loud by the leader and the responses (R.) are prayed by the others present. The Hail Mary is prayed by all.